SECRET FUN BLOG: HAVE YOU SEEN THIS PAINTING? 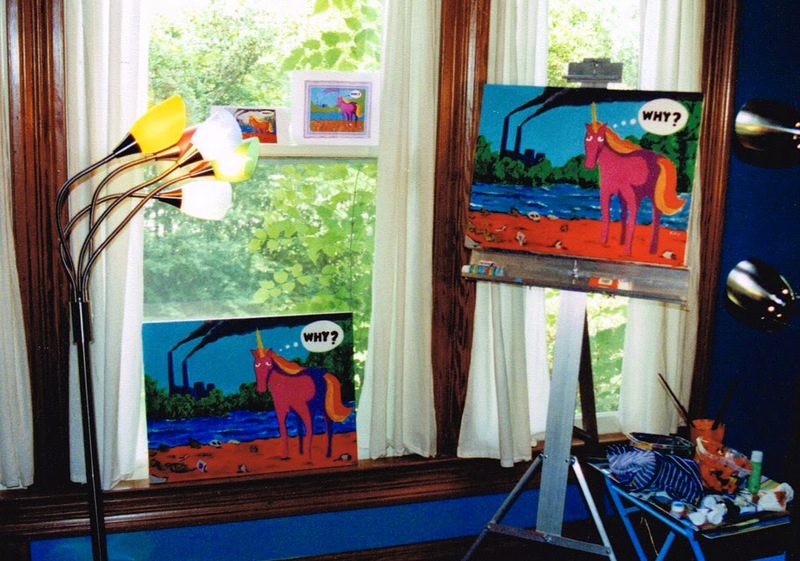 The only existing photo of the missing painting, laden with compression artifacts since it was taken in 1999 with a cheap digital camera. 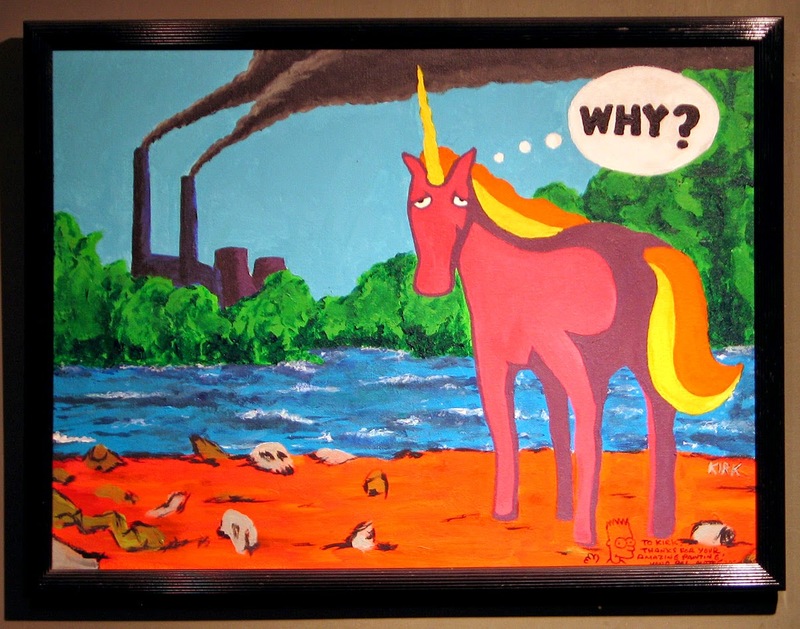 Artist: Me, though the painting is unsigned by me. 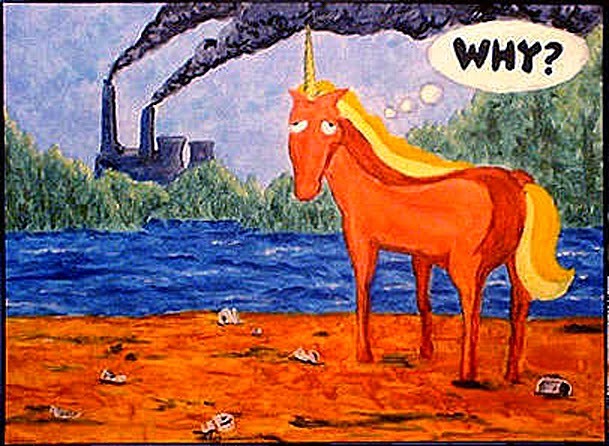 Description: An oil painting of a unicorn standing in the foreground with a thought bubble asking, "Why?" There's a nuclear power plant in the distance. I longed to visit the San Diego Comic Con since I first read about it in the back of the 1986 Overstreet Comic Book Price Guide. It took seventeen years for me to find friends with the same wish, but once we discovered our common goal the other pieces quickly fell into place, and soon we were packing our bags. I was thrilled to see Matt Groening on the list of attending guests because no work of art is wedged deeper into my psyche than The Simpsons. Then a natural fanboy impulse occurred to me; I wondered if I could get his signature. I was no autograph hound, I did own a couple that I happened upon at some small sci-fi fests, but this would be the first time I had a chance to get something signed by a true cultural hero of mine. The fact that the autograph roster had no listing for Groening didn't deter my hopes. I was searching for the perfect autograph-ready object when my wife suggested that I bring an oil painting that I did during the summer of 1997. My painting (seen above) is a reproduction of a cartoon painting that appears in the episode "Brush With Greatness" (Season 2, Ep. 18). 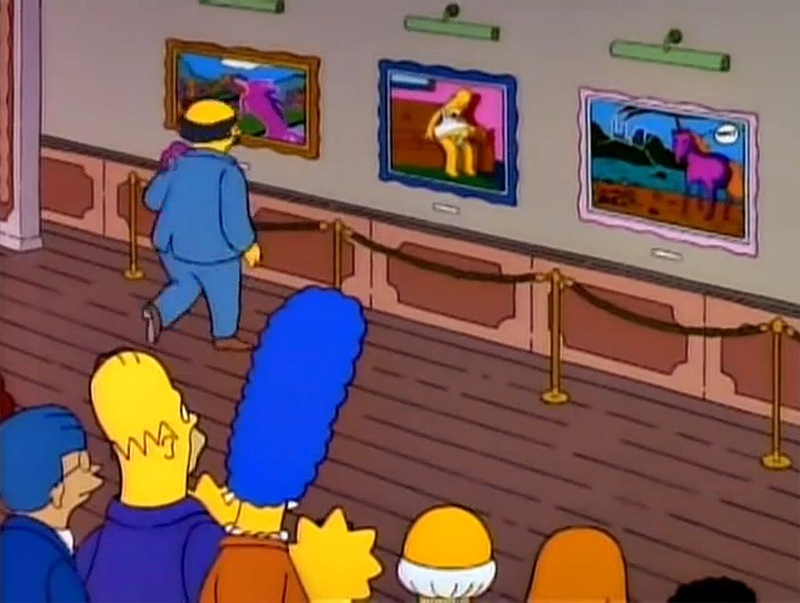 In the show, this piece is a finalist in an art competition before it gets narrowly defeated by Marge's depiction of Homer passed out in his underwear. Though it only appears onscreen for a split second I've always considered it one of the highlights of the episode. It perfectly satirizes what happens when an artist has a message, but no sense of subtlety. I was tired of pausing my VCR to get a laugh at it, so I decided to paint it. It was like bringing a Simpsons prop into the real world and hanging it on my wall. I was hesitant to bring it to Comic Con for many reasons: I didn't want anything to happen to it, packing it would be tough, and it seemed weird to ask Groening to sign something that I had created, I thought it might even be forbidden. But all of my other options were typical licensed trinkets, so uniqueness won and I stuffed the painting in my suitcase. 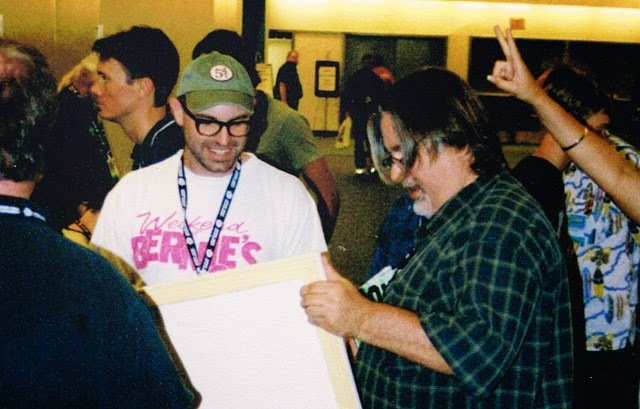 When I arrived at the San Diego Convention Center my first task was to locate the Bongo Comics booth and get the scoop on Groening. I was told that there would indeed be an unannounced autograph session the next day! But you had to have a Bart Buck, a ticket they issued to control the number of autograph seekers. Also, the Bart Bucks were all gone. Oh, well. At Friday morning breakfast a buddy shared a rumor that another round of Bart Bucks would be issued at 10:00 AM. I leapt from the table, but was defused when I saw that it was already 10:30. However, this second round gave me hope. I raced to the vendor floor and it turned out the Bart Bucking was rescheduled for 2:30 that afternoon! At 1:45 the booth was empty enough to roll around on the floor. (I did not.) It seemed we had time for a quick bathroom break, but this was the thinking of a Comic Con novice. Upon our return, the booth and surrounding aisles were congested with legions of Buck seekers to the extent that officials were discussing fire code violations, and even shutting down the session. The rest was a sweaty blur. A line was roped off around us, and after snaking through it for about ten minutes I was handed a slip of green paper bearing Bart's face. Only about a half-dozen people behind me got one before the supply was cut off. The Buck entitled me to enter an enormous sun-lit greenhouse of a room where I walked past Lou Ferrigno, Peter Mayhew, and the guy who played The Greatest American Hero before seeing the winding serpent of lucky Groening fans sitting on the floor in wait. I never thought I would live an hour watching Kevin Smith talk to people. You might think this situation would merit at least one anecdote worthy of at least one extra sentence, but it did not. If you stop and imagine the moment right now, I promise you the real event was in no way different than what you just envisioned. Once Groening was in viewing distance I understood why the line was so slow. 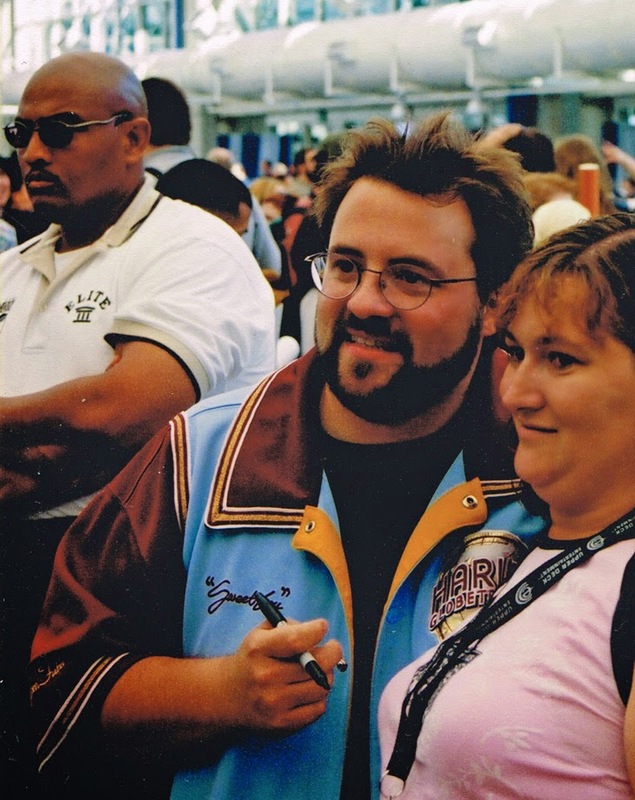 He was chatting, posing for photos, and in most cases, drawing character requests for every fan he met. It was really amazing. I also noticed a sign on the table that said "NO SKETCHBOOKS" which I still don't understand given the many drawings he made. But it was enough to stoke my fears anew for the final forty-five minutes. We made it to Matt's table and he looked beat. He was sweaty and lethargic and nearly opted out of the photo that my friend Erik requested. Matt's assistant asked my name and wrote it on a piece of paper. When it was my turn he slid it over to Groening as I nervously pulled the painting from my bag and said, "You may recognize this image." He squinted at it and said, "Oh, yeeeeeaaaahh." clearly unable to place it. I explained the context as other people around me chimed in with comments and questions. Matt continued to stare at it. Fearing his thought process I said to him, "if you have any problem with signing someone else's work, you could just put "not painted by Matt Groening" or something like that." "You sure you want me to sign it?" Wondering if that was a hint that he didn't want to, I said, "I would love for you to sign it." He began drawing Bart's head and a word balloon saying "Great art, man!" Then Groening asked, "So this was a Marge painting?" and I explained again. Then he told me, "It's amazing." He complimented me on the originality of the idea, and told me that I should sign it too. He's right, I should have. I walked away from the table and stood in awe as I took in the signature and the one Bart drawing in the world that was made with me in mind. I always feel foolish admitting how exciting a celebrity encounter can be, but that meeting coupled with his reaction was exhilarating. My other friend, Todd, was still at the autograph table and handed Matt a comic book to sign. Groening looked up at Todd (not knowing he was with me) and said, "That was un-believable." Then someone tapped me on the shoulder and pointed at Groening who was shouting "Hey!" to me. I looked over and he yelled, "That is UNBELIEVABLE!" With my eyes all full, I yelled back a thank you, and walked away with a feeling of elation that I seldom reach. With cinematic timing, my friend Scott came running over and interrupted my afterglow to tell me we had to get to the masquerade area immediately. As a first timer, I wasn't even sure what the masquerade was, I just knew that it's considered a high point of the weekend, and contrary to my first assumption, it is not a costume ball. Best of all, we'd been invited to sit in the VIP section by David E. Allen, one of the masquerade judges who was promoting a werewolf movie he produced called Dog Soldiers which still has a large cult following. I know David because we're from the same small town, fifteen hundred miles away from San Diego. However, this whole seating opportunity was very shaky. We wouldn't know until the last minute if there was room for us. This was a gamble because literally thousands of people had been standing in line for the event for hours, so if this didn't work we would miss it. 1. There's no way of knowing exactly what time we'll be called, IF we're called, so we must REMAIN ALERT! 2. We have to be prepared to RUSH into the auditorium at a moments notice. So we must have everything ready to go IMMEDIATELY! If we don't make it in with the rest of the group, we don't get in. 3. We will NOT HAVE BACKSTAGE ACCESS or be given passes of any kind. We will only pass through quickly to our seats. 4. As we are being ushered through backstage we MUST STAY CLOSE TO OUR GUIDE, or we will be thrown out. 5. Once we are seated we are NOT PERMITTED TO GET UP FOR ANY REASON! So go to the bathroom now. 6. Once inside the auditorium we MUST STAY THERE FOR THE DURATION OF THE PROGRAM. 7. Once the show is over we must REMAIN IN OUR SEATS until we are ushered back out. After the briefing I was both excited and stressed, and I had a new appreciation for the opportunity I'd stumbled into. The orders had momentarily distracted me from my Groening victory. I pulled the painting out of its large plastic bag for another look, and settled back into bliss. For the next while we were in a true hurry-up-and-wait situation. The call could come at any second, but the interim stretched until anticipation turned to boredom. It felt longer than it was given our confinement to a small conference room with no windows and no smart phones to check, being that it was 2003. Some people started spilling into the hallway where the door opposite revealed a sunny outdoor balcony. My buddies and I opted to step out for a quick photo overlooking the San Diego scenery. I put my camera on self-timer and captured a split second of our—"GET IN HERE, IT'S TIME! NOW!" I scurried to get my camera back in the bag while slinging my backpack over my shoulder and trying to catch up with the group that was quickly funneling into the backstage area. We made it to the back of the speed-walking procession. With all the efficiency we'd come to expect, we soon found ourselves seated in the front row. I turned around in my seat, careful not to raise my body into anything that could be misconstrued as standing, and I saw thousands of eager people sitting in a room that was larger than a football field. Then the lights went down. The cheers only sounded human for a moment before my ear drums capped out, and my physiological hardware could no longer offer my brain anything it could make sense of. The energy was unlike anything I'd felt. Frisson tingles sparkled all over my head and neck. With no introduction, a fan film appeared on the giant suspended screens called Batman: Dead End. Without spoiling it, the film combines several beloved characters, and it's impossible to exaggerate the ecstatic response from the crowd. This was followed by a string of movie trailers that had yet to be seen anywhere. The crowd was so hot that even the preview for I,Robot got explosive screams. 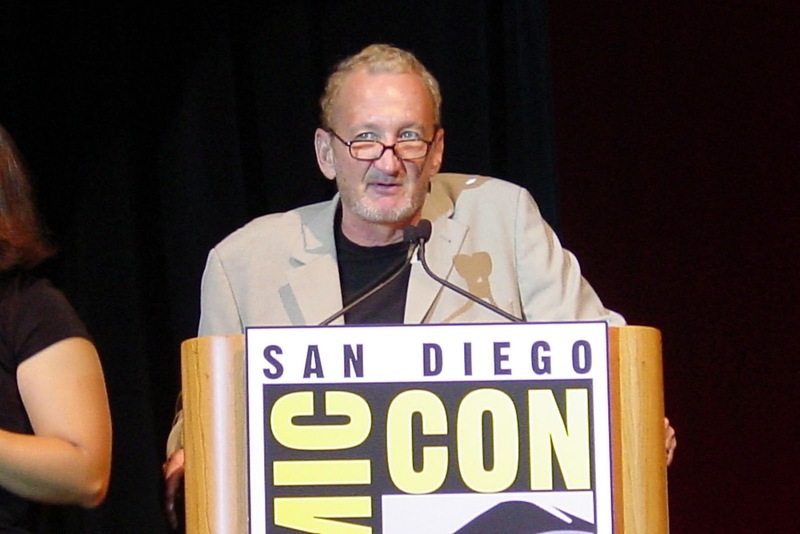 Then Robert Englund took the stage, the man who played Freddy Kreuger! As an official Freddy Fan Club member I took a moment to reflect on how surreal it was to see Englund just after meeting Matt Groening, and again I was reminded of the joyfu—WAIT! WHERE IS THE PAINTING!? I felt all around my feet and frantically asked my friends about it. Oh, no. Did I even bring it in the auditorium? My mind flashed to our hurried exit from the balcony. The balcony! I started to stand when the tirade of rules flooded my mind. I was trapped. The painting had only been unattended for about fifteen minutes and the balcony wasn't accessible to the public so I still had hope, but still, I was trapped. "I think I've got to go back." I told my friend. Erik's eyes widened and he laughed in disbelief. Then he thought about it and said, "Do it." I sat frozen and looked past rows of people to the backstage door which was very small from this distance. I stood up and race-walked towards the forbidden area. Everyone in the auditorium was too busy looking at the stage to care. I reached the backstage and found it nearly empty. Then I heard, "Sir?...Sir!" and I quickened my pace. I realized that I didn't know where our waiting room was and remembered that it wasn't a straight shot out. I veered down a couple dead ends before getting back on track. In the process I encountered more staff, but I decided to play it confident, looking them in the eye and nodding. It worked a couple times, but then I heard, "Excuse me!" and I broke into a trot. I burst through the waiting room door and out to the balcony. The whole place was deserted, but also absent was the painting. My next move was to scan the nearest portion of the massive vendor floor, but there was a problem. The painting was in a large Tokyopop bag that I'd received as a freebie promotional item. 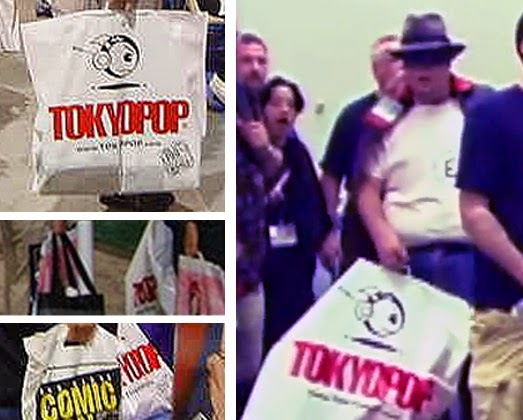 Literally thousands of these bags had been handed out since the first night of the convention. Soon I was wandering aimlessly in a cloud of heartbreak. To top it off my friends wouldn't be released from the VIP section for at least an hour. Having nothing left to lose I decided to reclaim my front row seat in the masquerade. I pushed open the backstage door and walked through the halls with a steady, solemn stride, like a grizzled action hero walking away from an explosion. Someone appeared behind me. "Hey!...Sir!" I continued on. Then from the other side, "Can I help you?!" "Hey!" But I'd made it back to the show where my seat awaited me. I updated my friends, and then tried to lose myself in the festivities. 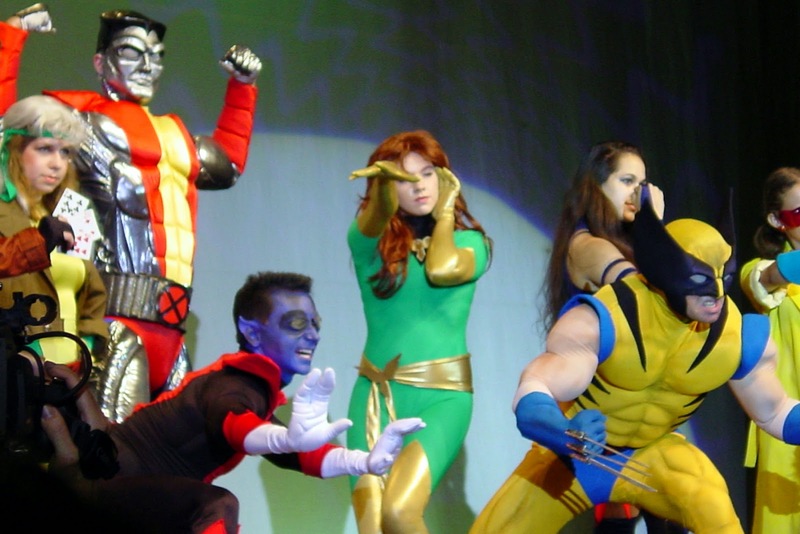 I discovered that the masquerade is primarily a costume showcase where cosplayers (a term that may not have existed yet) took turns parading around the stage. There were some truly incredible entries, but in my lousy mood I couldn't understand all the hype. I asked my friends if they wanted to leave early with me. Their initial response was, "Are you serious?" but moments later the three of us walked the unauthorized, yet familiar path to the exit, unquestioned by the authorities. Then we carefully considered our options, and the only one that made any sense was to take a train to Tijuana, but that's another story. During the plane trip home I wrote an account of the whole experience (which is why so many of the details survived.) I ended by saying, "I will paint another one. Two actually, one for Matt and one for me. This is just the beginning." During the months that followed I couldn't bring myself to watch The Simpons. But I did make good on my vow, and repainted the scene twice. Miraculously, I was able to return to the convention the very next year because a short that my friends and I made was accepted into their film festival. 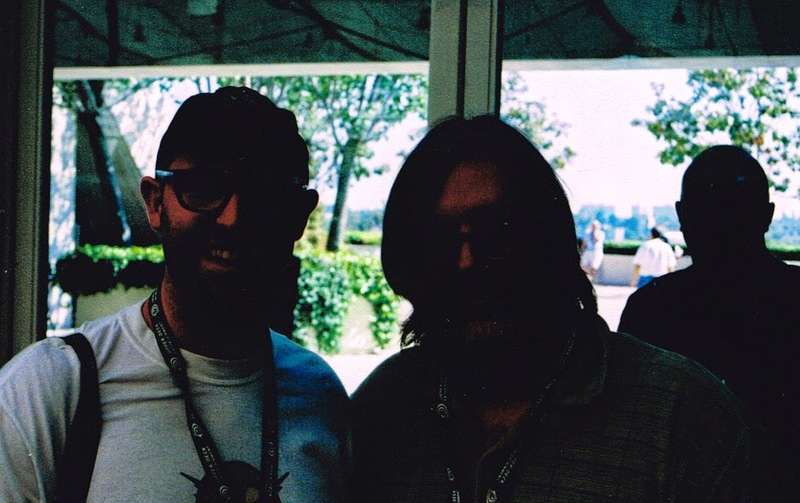 I also managed to run into Groening the first day and tell him my tale. He said he'd hang the painting near the bathrooms at the Bongo Comics headquarters. He joked that it would reside "right next to the other one." At this point I'm at peace with the loss of other one. I do regret that my reproductions ended up with a less natural look and color pallet, and weren't quite as finessed as the original. But now I have my story, my new painting, and I have a resolution. Best of all, I no longer associate The Simpsons with feelings of heartache and loss. I wish I could say the same about Family Guy. 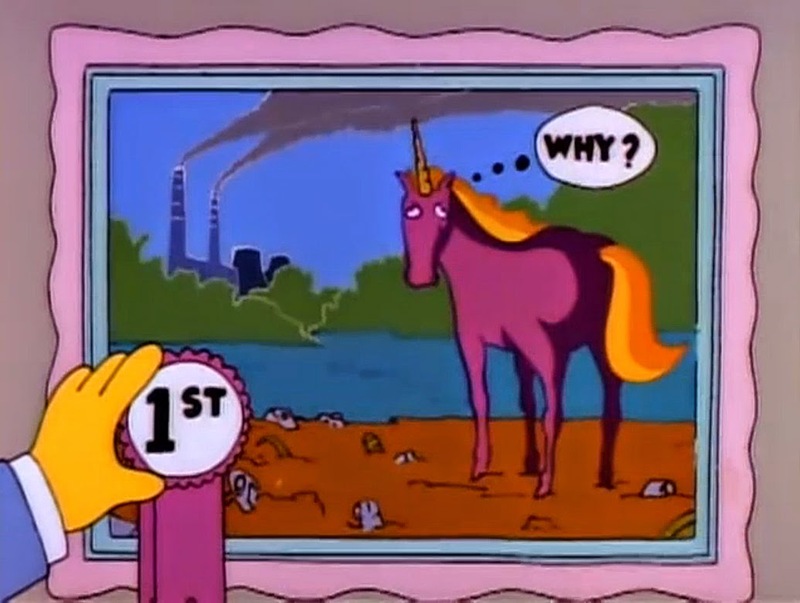 "Why?" version two, signed by Matt (and me). Still, I'm extremely curious about what happened to the original, even if I don't get it back. I'd love to hear about its journey, or even see where it hangs, if it's hanging. If you have any information regarding the first painting, please comment on this post or email me. You can do so anonymously if you wish. I also invite you to share my story anywhere you see fit. I can't offer a grand reward, but I'm sure I could come up with something fun. While I've heard this sad tale many, many times it still remains one of my favorites. Thank you Chris. Please read it again now. A really interesting life event. Four years on - are you any the wiser about its whereabouts? Andrew, the mystery still stands! Not even a clue has been revealed.